Four fantastic days in Vancouver! I clearly remember what Kim and I promised each other before we moved to New York. We looked each other in the eyes and agreed that we would move to New York because we wanted to get the best possible help to Vitus. We wanted to challenge the autism diagnosis that he was given in Denmark when he was just two years old and we wanted to be in a place where people would have faith in us – where we wouldn’t meet sceptical eyes because we believed in just that. But we also promised each other that we were not going to turn our kids into americans. We were going to stay as long as we felt that our son would benefit from the american system and when we knew in our hearts that we had done everything we could, we would move back to Denmark. The first couple of years in New York were hard work. Not only did I do a lot of work with Vitus, which included a lot of training at home and at centres both close to and far from home. – I also had a wonderful daughter who was trying to adapt to a new language and school life on Manhattan which wasn’t always easy. 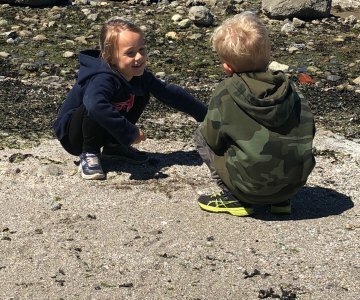 The last year in New York – when Vitus started kindergarten (which is the same as grade 0 here in Denmark) – was by far the best for all of us, and I cannot describe how it has been to finally have a boy who was ready to fly. – A boy who was ready to take on the world and not be scared. I had my doubts and I almost didn’t let him start school, but boy, I’m happy I did! It has been an unbelievable year! Magical, in fact, and I still have to pinch myself really, really hard to check that it’s all real. Only a few years back, I wouldn’t in my wildest dreams have believed that Vitus would have thrived the way he did during his year in kindergarten. It has been the craziest and most rewarding experience – and being a spectator to his journey has been indescribable. From timid to open, from sceptical to trusting. He has come such a long was and seeing his progress – and knowing that we are NOT the only ones seeing how he has developed, is pure happiness! 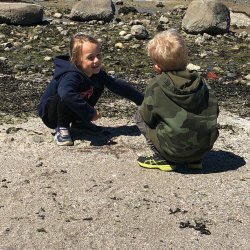 His learning curve exploded during kindergarten, and at the end of the year we had a more robust, open and trusting little boy who is eager to learn. Thank you SO much to all his teachers – thanks for seeing him for who he is and thanks for working with him every single day based on his actual needs and not based on papers telling you something different. I am forever grateful. Below you can see a few of his grades and his teacher remark just before he finished kindergarten. I am so proud of him. I’m especially proud of this one – which really shows that he came a long way – starting as a more cautious and timid boy, developing into someone who’s not afraid to try.